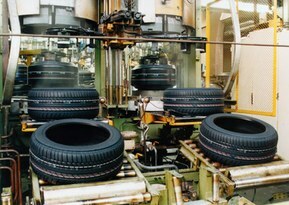 There are various production stages involved in the making of tyres. It all starts with the internal mixer. This is where the necessary raw materials are further processed to become what are known as sheets. The raw materials are mixed, rolled, cooled, mixed again and rolled; a process varied according to the type of tyre and component until the desired material property has been achieved. After all, such a high-tech tyre comprises 12 or more different rubber compounds. A specific formulation is used for every type of tyre and the internal mixer produces 60 to 90 tons of sheet daily as part of a multi-stage mixing procedure. The ÖLFLEX® CLASSIC 110 connection and control cables serve as supply cables for the motors and raw material scales. These cables are particularly compact in size and, with 4kV test voltage, guarantee a high level of safety. The UNITRONIC® BUS PB FD P A cables are used for the transmission of data to the sensors and actuators. These cables are particularly suited to applications that require considerable flexibility, not to mention halogen-free, flame-retardant and oil-resistant. Safe transport to the feeding conveyor is guaranteed by the ÖLFLEX® FD CLASSIC 810 P cables. As oils are also mixed here, the highly oil-resistant ÖLFLEX® 191 connection and control cable is used. A particularly high performance is demanded from the barrel extruders and the calender which rolls out the sheet. This is why the multifunctional ÖLFLEX® CLASSIC 100 CY connection and control cable with a cross-section of 95 millimetres and the ÖLFLEX® FD 90 CY drag chain cable with its tin-coated copper screen braiding are used. The UNITRONIC® BUS PB FD P A cables are used for all sensors and actuators. Car tyres are required to meet the highest of safety standards. They need to be able to cushion and absorb, to ensure directional stability, have smooth running characteristics and a long life, as well as be able to transmit power in longitudinal and transverse directions. Manufacturing such high-tech products is a core competence of the Continental concern. And for many of its production areas, Continental places its trust in the reliable cable and connection technology of Stuttgart’s LAPP. Such as the “Internal mixer 8”, launched in December of last year. The top-class quality of LAPP brand products met all requirements here, as did the company’s superb single-source service. An important feature here was the wire labelling as plenty of dust collects in the internal mixer. ÖLFLEX® CLASSIC 110 connection and control cable, UNITRONIC® BUS PB FD P A cables, ÖLFLEX® FD CLASSIC 810 P cables, ÖLFLEX® 191 connection and control cable, ÖLFLEX® CLASSIC 100 CY and the drag chain cable ÖLFLEX® FD 90 CY. With turnover to the tune of 26 billion Euro in 2010, Continental can count itself among the world’s leading automotive suppliers. As a vendor of tyres, braking systems, systems and components for drives and chassis, instruments, infotainment solutions, vehicle electronics and technical elastomer products, Continental is contributing towards increasing driving safety and protecting the global climate. Furthermore, Continental is a competent partner in networked automotive communication. The company currently employs around 155,000 workers in 45 countries (as at: May 2011). It is the market leader for car tyres in Europe, with more than 30 percent of all new European vehicles driving away from the factory in Continental tyres.